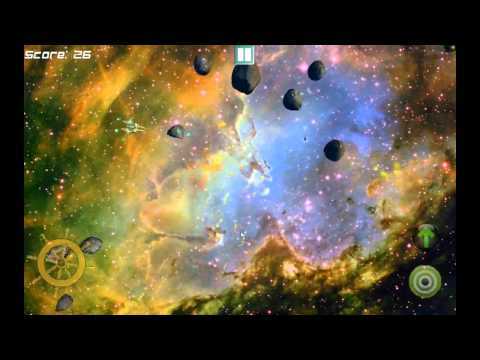 A 3D arcade game optimized for Tegra devices: Survive in a deadly asteroid field by creating chain reactions to destroy them. While you were travelling on a routine flight, you were dragged out of hyperspace. You now are in a deadly asteroid field, territory of the Zaadiqs, a scavenger species which trap travelers and wait they are crushed by the rocks. When the asteroids collide, one of them may become magnetized. Then it will follow any non Zaadiq ship in its range. If a rock hits your shield, it will explode and disable it. Your shield will then slowly recharge. Attention, each time you fire a laser blast, you will lose 1 unit of shield. On the contrary, if you wait long enough without firing laser, your systems will be overloaded, which will give you access to the powerfull ionised shield and lasers. Objects destroyed by ionised systems will generate 3 deadly ionised fragments which can destroy other objects in a chain reaction pattern. The deeper the object is in the chain level, the more points it will give you. Warning if you take too much time to die, Zaadiq ship may appear, trying to destroy you quickly with its powerfull protonic laser. An asteroid hitted by this laser will become magnetic and will follow your ship. If your shield is hitted by a protonic laser, it will be disabled. - Time limited system overload. - Quantum mine. You can store up to 3 of them. Simply tap on a rock or a Zaadiq to teleport a QMine which will immediately destroy the object. - Nuke: tap your ship to destroy all rocks and Zaadiq around your location. - Time limited speed boost. You can control your ship with the accelerometer, or by using the touchscreen.